Men: the most difficult people to shop for. WHY IS THAT?! 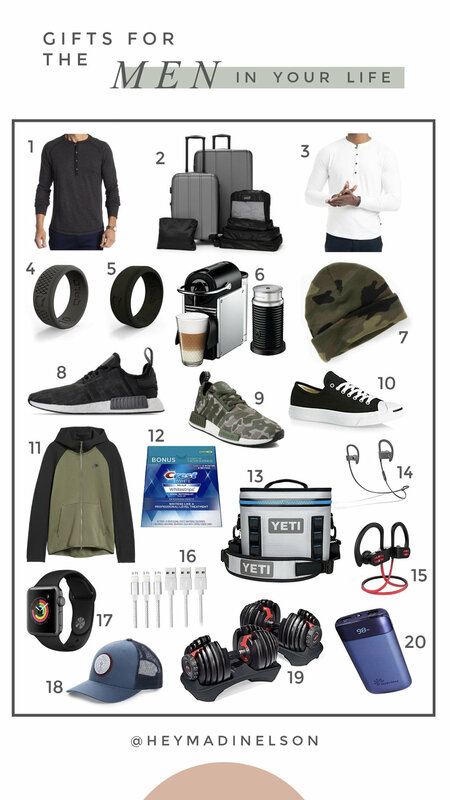 I came up with a combined list of things I have bought in the past as well as things I bought (well… they’re in my cart) this year! Henley Shirts | This brand of shirts is my favorite on David. They’re amazing quality and fit like a glove. They wash well and can be worn year round! Luggage Set | For the traveler! I got David this luggage set two years ago and he still uses it! I love how this one comes with the organizing cases and is under $150 (for the whole set!!!). Qalo Ring | I have talked about these rings so many times… but since we got married this is the ONLY ring that David has worn! He has it in several colors (including both of the rings shown above!). They are a GREAT gift and under $30!! Qalo Ring | See 4. Espresso Maker | This is another gift that David has used almost every day since he got it two years ago. For new dads or guys on the go, this is a great gift. Plus, you can get tons of accessories (pods, pod holder, etc) on amazon and stuff their stocking with those! Camo Beanie | $10… ordered this for David but it’ll most likely end up being stolen by me. LOVE. Adidas Sneakers | A new pair of sneakers has become a Christmas tradition for David… and I always buy him Adidas! I am loving these. Camo Sneakers | Aaaaand… these, too! Jack Purcell Sneakers | Y’all know David loves his Converse and Jack Purcell sneaks! I love this black pair… He has THREE white pairs, and black would be so cute with jeans in the winter and shorts in the summer! Nike Jacket | My mom got this exact jacket for David on his birthday. He LOVES it! It looks super cute with workout clothes, joggers, jeans, everything. I also love the colors. White Strips | These are a great stocking stuffer, this is the only teeth whitening product we use and we both swear by it. Plus, it’s not something a guy is really going to buy for himself! Yeti Cooler | Any guy would LOVE this. I love that this one is great to bring on road trips, boats, tailgates, beach, you name it! SPLURGE Beats Headphones | David has had at least three pairs of these headphones. But he always loses them! If you are looking to splurge, these are the BEST headphones. Great for exercise, running, travel, everything. But…..
SAVE Amazon Headphones | After losing 3+ pairs of pricier headphones, David ordered these off Amazon and he says they’re great. He has had these for 6+ months and they’re still kickin’- he uses them everyday! iPhone Charger Cords | BECAUSE I AM ALWAYS STEALING HIS CHARGERS!!! And these have 2,000+ FIVE STAR reviews!!! Apple Watch | I bought David an Apple Watch 2 years ago and he wears it every single day. He would pick his Apple Watch over a fancy watch any day. When I asked him what I should add to this list he said “Apple Watch”. David’s Favorite Hat | If you follow us, you know David wears a hat 99% of the time. We got this hat at Nordstrom last year and it has become his favorite. The branding is small and it doesn’t have a big sports team on it. I am ordering him the black one for Christmas this year. Weight Set | Okay, SO… I ordered David this dumbbell set on amazon for his birthday because my dad has the same set- and he has always liked my dad’s! I am not lying when I say he has used them everyday since he opened the box! He keeps them in our garage and it makes it SO EASY for him to get a quick 15 min workout in any time of the day. LOVES THESE! But… they are pricey! But worth it! My dad has had them for years and years. Travel Charger | This has 3,000+ FIVE STAR reviews and same day shipping sooo…. ordered it. Also, we are constantly losing these things. You can never have too many chargers! Great stocking stuffer. Here are a few other items we have and love!